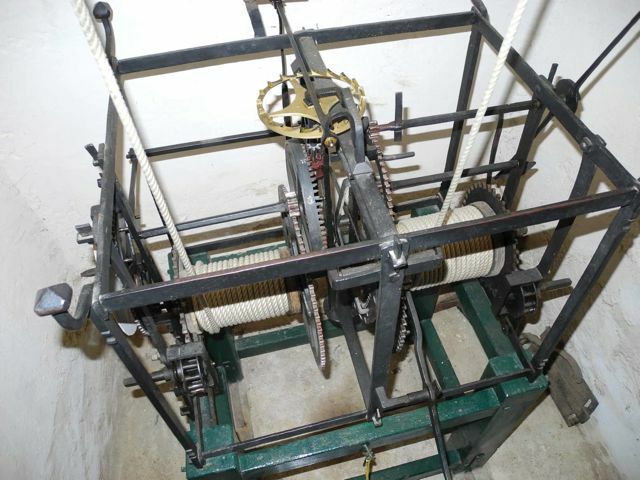 The clock is described as existing, 'in a substantially original state with a crown wheel and verge escapement' although it is clear that the clock has been repaired a number of times most recently I believe in 1991. 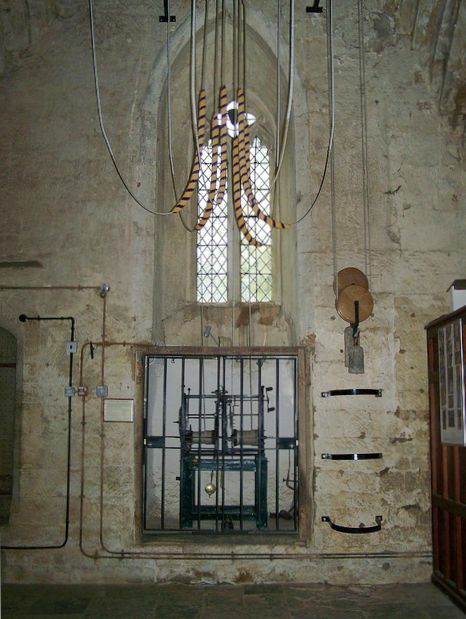 Intriguingly the clock has no dial, it is simply set to strike the hours on the tenor bell up in the tower. Beeson also seems to have had access to information about Sir Anthony's library for he reports that Cope owned a copy of G. da Capriglia's Misura del Tempo of 1665, 'the earliest treatise on clocks, which describes and illustrates turret clocks'. The strapped bell held in place by five turned brass finials (central one reduced) divided by three pierced frets, all of which, unusually, are engraved with flower heads and addorsed mythical fish, over four gently tapering Doric columns on ball feet, the top plate with wrought iron wall fixing points, the bottom plate with spikes, the 6 and 7/16s of an inch-wide chapter ring with distinctively squat Roman numerals, inner quarter hour track and unusual 'spearhead' half hour marks, drilled at V and VII for the winding squares, with (later?) single hand and fully signed centre 'George Harris in Fritwell Fecit' engraved with flower heads, leaves and buds, the weight driven movement with short verge bob pendulum on a knife edge, the going and striking trains mounted one behind the other with grooved barrels, the strike wound on the right hand side via an elongated steel winding arbour (the hammer arbour with an old break) and outside countwheel 37cm (14.5in) high. George Harris was born circa 1619 and died in June 1694. He appears to have remained around the Fritwell area for all of his working life. A memorial tablet in Deddington Parish Church engraved and signed by Harris illustrates well how some makers in this early period turned their hands to whatever work was offered. The form of signature, with the elongated 'G' and curved 'H' are identical to the current lot. This work obviously stood him in good stead with the local clergy as he went on to repair the clocks of other local churches in 1669 and 1682. It is thought that there are only three makers to use the barrel winding system, all based in the Fritwell vicinity. 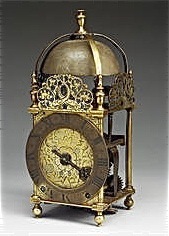 The National Trust also register their ownership of a Harris lantern clock dated 1668 at Cotehele House, Cornwall (National Trust Inventory Number 347886). Beeson outlines Harris's family history and goes on the itemise the contents of his will but he does not explain why Harris was chosen to undertake the work for Sir Anthony, after all there were better clock makers in Oxford and closer clock makers in Banbury. Was there something about Harris's innovative techniques that appealed to the virtuoso? 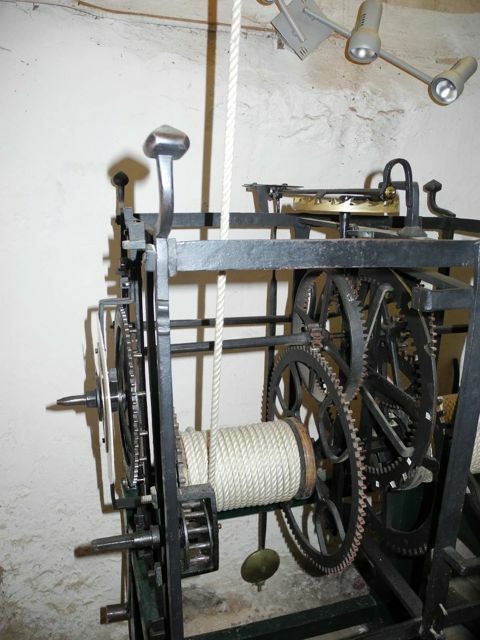 George's third son, Nicholas (1657 - 1738) took over his father's tools and was responsible for the clock in Great Milton Church in 1699. 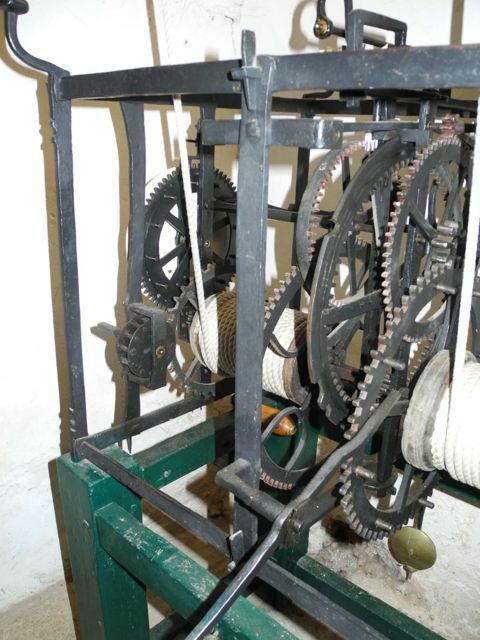 And finally one irkibby was good enough to put this video of the clock in action, accompanied by bell ringers, onto You Tube.